Welcome. 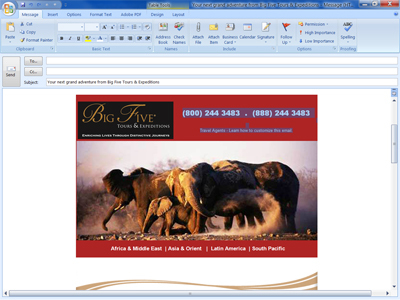 We are happy to have you forward our emails to your clients. Follow these easy steps. 1. To begin, click on the forward icon. The email will show up in a new window. 2. Using your mouse, hold down the left button and highlight the top portion that you want to delete. 3. Delete the highlighted portion. 4. 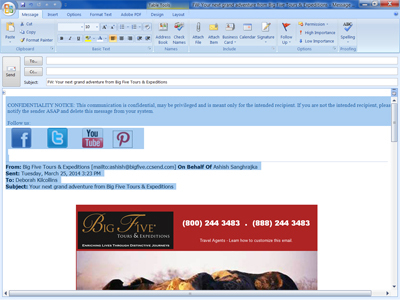 Moving onto the email itself, again, hold down the left button on your mouse to highlight both our phone numbers and the text “Travel Agents-Learn how to customize this email.” and delete. 5. At this point you can insert your logo in the box with our logo. Please leave our logo in place. 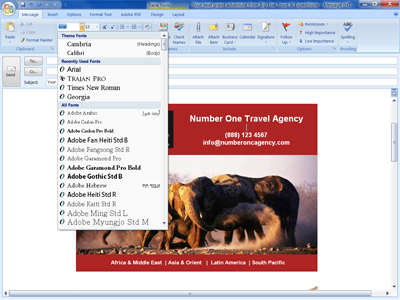 Or, you can simply opt to add your agency name and contact details. You will need to select your font, font size and font color. 6. Once you are happy with the look, then simply send this out to your email list. 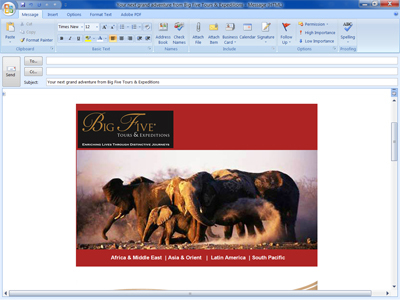 Thank you for your interest in Big Five. Happy Emailing!